If your business is in the southeast or east coast areas, right now, you’re prepping for a major snow and ice storm tomorrow. The things you’re probably considering right now are making sure you have food in your home, ensuring that you have extra batteries and tool kits handy. 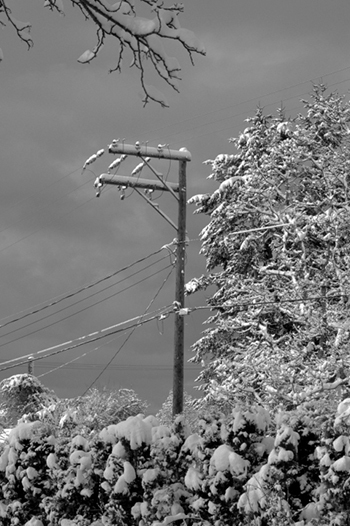 However, preparing for business interruption during a major storm (that already has power outages predicted) is an important part of your pre-storm plan. Back up your data – Making sure that your data backup is up to date is essential if your power goes out. Losing data that you have built since your last backup would be detrimental to your business. Talk to your clients – If you have clients nationwide or worldwide, they may not be aware of the coming storm. Make sure they know where to reach you if you are not in the office and warn them of possible downtime. Prepare for Tele-commuting – For those who have power at home, or can easily get to a place that does, be prepared for your employees to be able to work from home to cut down on travel time in bad weather. This includes taking all essential electronics, files, and notes home the day before the storm. Keep an Updated List of Employee’s Contact Info – When road conditions are hazardous during and after winter storms, it is important to be able to reach your employees when you can’t make it into the office. Keep an updated list of everyone’s cell and home-office numbers so you can reach essential personnel in case of emergency. Our Voice Continuity Plan. It completely eliminates the need for warning your clients of communication loss, worry about the impact of telecommuting on your communications, and keeping a list of employee contact information. Our Voice Continuity Plan automatically fails over at the time of a power outage and completely replicates your existing phone system in the cloud, making a completely seamless transition for clients and prospects trying to reach you. All phone commands, recorded messages and prompts that callers hear when dialing into your office number remains intact, but each line rings to a pre-determined soft phone. Follow our blog for more information about business interruption and, in particular, voice continuity planning.